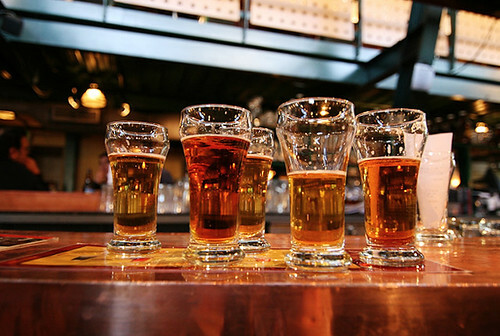 Not only do we remain big fans of beer, our appreciation of the art has grown and evolved. It wasn’t always easy, considering there are a lot of bad beers in the world. Indian cuisine may be amazing, even awe inspiring, but Kingfisher is no winner in its category with that unhealthy glycerine additive. 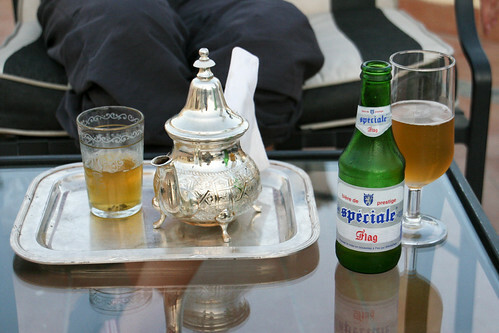 The “Worst Beer in the World” award has to go to Morocco for Flag Especial: foul, expensive and yet blissfully difficult to find due to strict Muslim laws. Most of the world really only produces your basic pale lager, in the vein of, but thankfully better than, Budweiser. Back in the States, here’s our market haul with local beers, Japanese suds and even some special Scottish ale aged in whiskey barrels. Which brings us to our next point… After traveling with food and drink on our minds for one year, we now know America has some of the richest beer culture in the world. Yes, we do apologize for Anheuser Busch and Budweiser (and even more so for stealing its name from an age old Czech company), but dig a little deeper and you will find that we not only import some of the best beers in the world, we are one of the most dedicated micro-brewing countries, where the public wholeheartedly embraces locally produced pints. With this in mind, Team Rees has now settled down for the summer in the San Francisco Bay Area and we are beginning a local brew & pub quest. In California and in the Pacific Northwest it seems like every city has a brewery or two up it’s sleeve, and local markets nearly favor local ales. We’re hoping we can hit up a brewery once every week to get to know the brew culture and sample the offerings. For an easy start, we stopped by Pyramid Brewery in Berkeley, well known for their Hefeweizen (recently renamed Haywire). 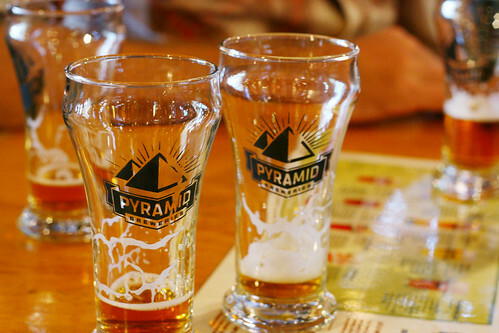 Pyramid started out in Washington, but today they have 5 Alehouses along the West Coast which feature a small-scale brewing operation onsite. 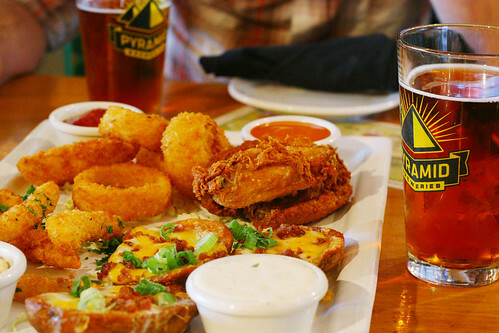 Each Alehouse offers some free tours of the facility and they work hard to have a social, community-based atmosphere with quiz nights, souvenir nights, movie screenings and more. We were never big fans of the Hefe, which is pretty ubiquitous in California grocery stores and bars, but the Alehouse offers many more brews which aren’t widely distributed (or in some cases, distributed at all). Our waitress was sympathetic to our trouble picking from the available taps and brought us over some free samples. Their flavors range from very mellow to very hoppy. The Apricot Ale and Blonde were a bit dull, but at the farther end the Grifter (from the MacTarnahan line) and Outburst (4 different hops) hit the spot. They were even pouring a Belgian-style Triple which had a gorgeous color and tasted satisfyingly herb-y, almost enough for us to forget it’s silly name. This is a decent brewery with some solid beers. Food is squarely in the bar category, but the location is clean, bright, and nicely decked out. 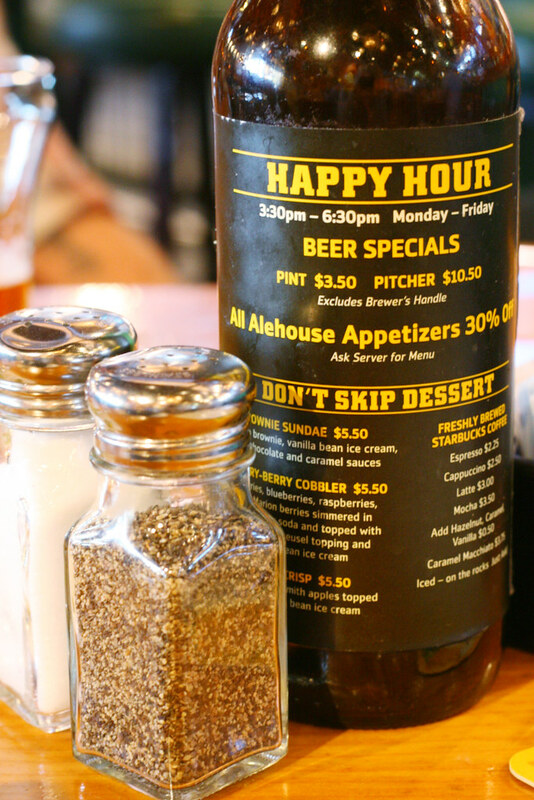 Sitting at the bar all but guarantees knowledgeable tidbits from the staff and some free tastes from the taps. 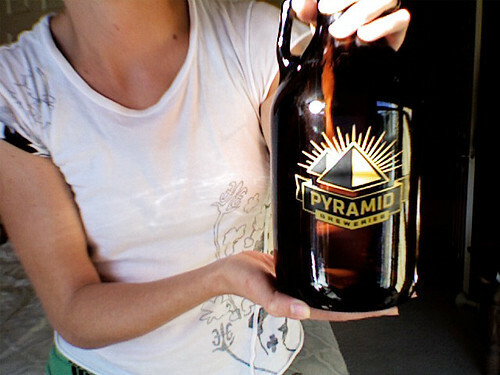 We even lucked out with the Earth Day sale on growlers — $10 for a new one and $5 for a fill. Not bad for a half gallon of IPA! 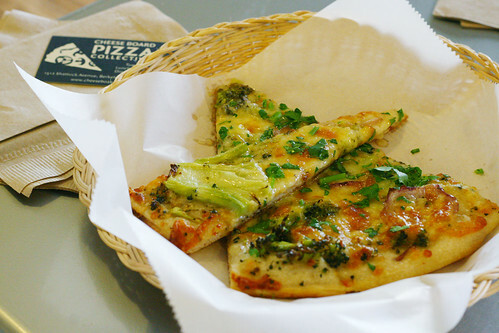 And when in the Berkeley area, stop by the Cheeseboard Pizza Collective for a though-provoking slive. The Collective only makes one type of pizza everyday, and each day brings new surprises. It’s not hard for us to make a brewery to do list: check out this list of Craft Beer Brewers in Northern California alone! Since we’re also looking for a new city to call home, we’ve scheduled trips out to Colorado, British Columbia, Washington and Oregon over the coming weeks — beer-ability is a big deciding factor, so hopefully we’ll be able to report on those areas as well. We can’t wait to tackle some taps from Alethea’s list for Portland. While we can’t hit everything… what with time, budget, and liver constraints, we will work diligently at what we feel is a foolhardy tumble into the warming, numb embraces of the best brewsmen (and women) on earth. I’m not a huge fan of the beer (though I am a fan of the results of drinking beer), but my favorite has to be the dark home brew at U Fleku in Prague. Man, Prague is a GREAT city for beer! We tried U Fleku as well (ahhh! ), but I think our most memorable time was at U Zlatého Tygra, where they only have one beer. You sit down and they bring you one and mark a hash on your table. Someone is always watching, and once you get the last sip down, another glass shows right up. You have to work pretty hard to get them to stop. The poor beer dispensing-guy is working mega-overtime filling glass after glass after glass. Good times! I can’t think of anything better than a small brewery tour! 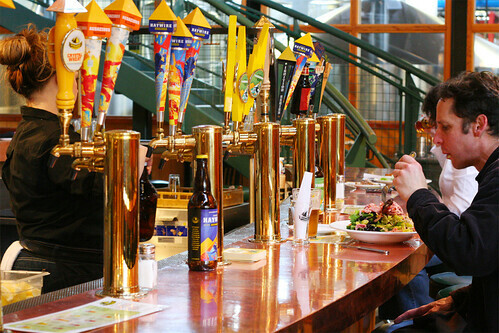 Victoria is home to the oldest brewpub in Canada and has a couple of other fine establishments also. Give us a shout if you find yourself on the island…we’d love to show you around! That would be great! We are absolutely planning on stopping in Victoria — we keep hearing great stuff about your hometown. I’m not a big fan of beer but the other half of Gourmantic enjoys it. A lot of what was imported European beer in Australia is now brewed locally or elsewhere giving off a different taste to those in the know. And they’re still charging import prices! I think a tasting would be a lot of fun. I didn’t know the US had so many breweries! That’s crazy about the import prices — the public should start a revolution! The Pacific Northwest in the US is particularly big on small scale brewing, but I think the whole of the nation is quite comfortable with local and microbrews. I think it has a lot to do with the incredible diversity of our imports. People like the variety, but not the prices, and off to the kitchen they go. Brew culture brings a lot of people together here and it’s not as uppity as wine. I absolutely love that your quest for a new home has beer as a major factor! I write to you in my professional capacity. Naturally this post hits close to occupational home. 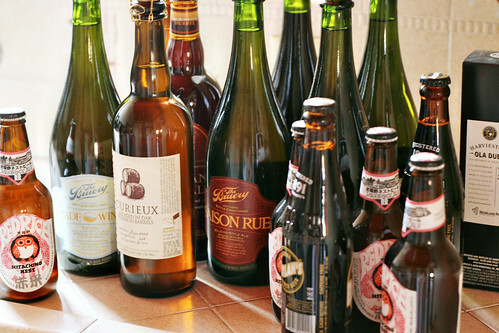 Lots of great brewers in the bay area. 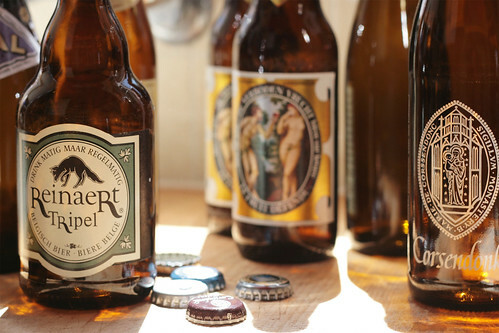 Petaluma is a hotbed with Russian River and Lagunitas…both are worth a visit. When you get back to SoCal, The Bruery (which I see you tried their Saission Rue) is also an interesting and innovative brewery. Also, Firestone Walker a little down the coast should also be on your visit list. Eva if you are back in the states for a while, email me. We can always use photographers from places we can get to ourselves and California often proves one of them .